Using this code as a base and later as a reference, developers created a Linux distribution that offers many features not previously found in consumer-level routers. Some features formerly required proprietary software. Before the introduction of OpenWrt 8.09, using Linux 2.6.25 and the b43 kernel module, WLAN for many Broadcom-based routers was only available through the proprietary wl.o module that was also provided for Linux 2.4.x only. OpenWrt releases were historically named after cocktails, such as White Russian, Kamikaze, Backfire, Attitude Adjustment, Barrier Breaker and Chaos Calmer, and their recipes were included in the message of the day (motd) displayed after logging in using the command-line interface. In May 2016, OpenWrt was forked by a group of core OpenWrt contributors due to disagreements on internal process. The fork was dubbed Linux Embedded Development Environment (LEDE). The schism was reconciled a year later. Following the remerger, announced in January 2018, the OpenWrt branding is preserved, with many of the LEDE processes and rules used. The LEDE project name was used for v17.01, with development versions of 18.01 branded OpenWrt, dropping the original cocktail based naming scheme. r6268 Old version, no longer supported: White Russian 0.9 January 2006 2.4.30 uClibc NVRAM-based, nas, wl. Supported platform: brcm-2.4. r7428 Old version, no longer supported: Kamikaze 7.06 June 2007 2.6.19 Using opkg. Supported platforms: atheros-2.6, au1000-2.6, brcm-2.4, brcm47xx-2.6, ixp4xx-2.6, imagicbox-2.6, rb532-2.6 and x86-2.6. r7832 Old version, no longer supported: Kamikaze 7.07 July 2007 2.6.21 New platform: amcc-2.6. r14547 Old version, no longer supported: Kamikaze 8.09 September 2008 2.6.26 New platform: ar71xx. r20742 Old version, no longer supported: Backfire 10.03 April 7, 2010 2.6.32 Supported platforms: adm5120_mips, adm5120_mipsel, ar7, ar71xx, atheros, au1000, avr32, brcm-2.4, brcm47xx, brcm63xx, cobalt, ep80579, ifxmips, ixp4xx, kirkwood, octeon, orion, ppc40x, ppc44x, rb532, rdc, x86 and xburst. r36088 Old version, no longer supported: Attitude Adjustment 12.09 April 25, 2013 3.3 CoDel (network scheduler) backported from Linux 3.5 to 3.3. New platforms: ramips, bcm2708 (Raspberry Pi) and others. r42625 Old version, no longer supported: Barrier Breaker 14.07 October 2, 2014 3.10.49 New platforms: i.MX23, i.MX6. With the Attitude Adjustment (12.09) release of OpenWrt, all hardware devices with 16 MB or less RAM are no longer supported as they can run out of memory easily. This section is about the wireless network router operating system. For other uses, see lede (disambiguation). OpenWrt features a writeable root file system, enabling users to modify any file and easily install additional software. This is in contrast with other firmware based on read-only file systems which don't allow modifying installed software without rebuilding and flashing a complete firmware image. This is accomplished by overlaying a read-only compressed SquashFS file system with a writeable JFFS2 file system using overlayfs. Additional software can be installed with the opkg package manager and the package repository contains approximately 3500 packages. OpenWrt can be configured through either a command-line interface or a web interface called LuCI. OpenWrt provides set of scripts called UCI (unified configuration interface) to unify and simplify configuration through the command-line interface. 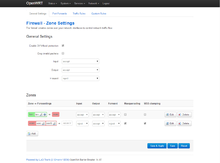 Additional web interfaces, such as Gargoyle, are also available. OpenWrt provides regular bug fixes and security updates even for devices that are no longer supported by their manufacturers. Mesh networking through B.A.T.M.A.N., OLSR and IEEE 802.11s-capabilities of the WNIC drivers and other ad hoc mesh routing protocols that have been implemented within Linux. OpenWrt's development environment and build system, known together as OpenWrt Buildroot, are based on a heavily modified Buildroot system. OpenWrt Buildroot is a set of Makefiles and patches that automates the process of building a complete Linux-based OpenWrt system for an embedded device, by building and using an appropriate cross-compilation toolchain. Embedded devices usually use a different processor than the one found in host computers used for building their OpenWrt system images, requiring a cross-compilation toolchain. Such a compilation toolchain runs on a host system, but generates code for a targeted embedded device and its processor's instruction set architecture (ISA). For example, if a host system uses x86 and a target system uses MIPS32, the regular compilation toolchain of the host runs on x86 and generates code for x86 architecture, while the cross-compilation toolchain runs on x86 and generates code for the MIPS32 architecture. OpenWrt Buildroot automates this whole process to work on the instruction set architectures of most embedded devices and host systems. Besides building system images, OpenWrt development environment also provides a mechanism for simplified cross-platform building of OpenWrt software packages. Source code for each software package is required to provide a Makefile-like set of building instructions, and an optional set of patches for bug fixes or footprint optimizations. OpenWrt runs many different routers, and includes a table of compatible hardware on its website. In its buyer's guide, it notes that users recommend devices equipped with wireless chips from either Qualcomm's Atheros or Ralink (now MediaTek). LEDE was a fork of the OpenWrt project. The two projects reconciled and merged under the OpenWrt name. Flukso – Wireless sensor nodes using an Atheros AR2317 chipset running a patched OpenWrt OS for communication. Sources and hardware schematics available on GitHub. Midge Linux – an OpenWrt-based distribution for devices based on Infineon Technologies ADM-5120 SoCs, such as Edimax BR-6104K and BR-6104KP. OpenSAN – iSCSI target Storage Area Network realization. PacketProtector – OpenWrt-based security distribution that includes IDS, IPS, VPN, and web antivirus capabilities. Packages included Snort, Snort-inline, FreeRADIUS, OpenVPN, DansGuardian and ClamAV. These tools were accessible via the old web GUI management interface of OpenWrt, called X-Wrt or webif^2. Project ended on June 7, 2012. ^ "OpenWrt 18.06.1 - First Stable Release - July 2018". ^ "OpenWrt 18.06". OpenWrt Project. Retrieved July 15, 2018. ^ "LuCI Translation Portal". September 1, 2004. Archived from the original on November 19, 2010. Retrieved December 31, 2010. ^ "git.openwrt.org Git - openwrt/openwrt.git/blob - target/Config.in". git.openwrt.org. October 24, 2017. Retrieved July 2, 2018. ^ Fietkau, Felix (June 16, 2015). "OpenWrt switches to musl by default". Retrieved June 16, 2015. ^ Miklas, Andrew (June 7, 2003). "Linksys WRT54G and the GPL". Linux kernel mailing list (Mailing list). Retrieved July 5, 2018. ^ Weiss, Aaron (November 8, 2005). "The Open Source WRT54G Story". Wi-Fi Planet. Retrieved July 5, 2018. ^ "Linksys Releases GPLed Code for WRT54G". Slashdot. July 6, 2003. Retrieved July 5, 2018. ^ Willis, Nathan (May 11, 2016). "LEDE and OpenWrt". LWN.net. Retrieved August 31, 2017. ^ Sharwood, Simon (May 10, 2017). "OpenWRT and LEDE agree on Linux-for-routers peace plan". theregister.co.uk. Retrieved August 31, 2017. ^ Wich, Jo-Philipp (January 2, 2018). "Announcing the OpenWrt/LEDE merge". LEDE Project Forum. Retrieved January 10, 2018. ^ "Welcome to the OpenWrt Project (OpenWrt Project)". OpenWrt. January 2018. Retrieved February 16, 2018. As of January 2018, the current Stable OpenWrt release [17.01.4] was built from the LEDE 17.01 source code, and branded with the LEDE project name. Development versions of OpenWrt are currently branded with the OpenWrt name, and have a version number of 18.01 "
^ "Release Notes Backfire 10.03". openwrt.org. April 7, 2010. Retrieved April 26, 2013. ^ "Release Notes Attitude Adjustment 12.09". openwrt.org. April 25, 2013. Retrieved April 26, 2013. ^ "OpenWrt BarrierBreaker 14.07". openwrt.org. October 2014. ^ "kernel: update to 3.10.49". dev.archive.openwrt.org. July 20, 2014. ^ "OpenWrt Project: Freescale i.MX". openwrt.org. Retrieved July 16, 2018. ^ "OpenWrt Chaos Calmer 15.05". openwrt.org. September 2015. ^ "[OpenWrt-Devel] Chaos Calmer 15.05-rc3". July 16, 2015. ^ a b "Chaos Calmer 15.05.1". March 16, 2016. Retrieved March 21, 2016. ^ "v17.01.5 Tag". July 15, 2018. Retrieved August 8, 2018. ^ "LEDE Project Releases". Retrieved August 8, 2018. ^ "OpenWrt/LEDE 17.01.5 - Fifth Service Release - July 2018". July 17, 2018. Retrieved August 8, 2018. ^ "[OpenWrt-Devel] OpenWrt switches to musl by default". June 16, 2015. ^ "Lua Configuration Interface: /modules/luci-base/po". May 10, 2017. Archived from the original on September 26, 2017. Retrieved May 14, 2017. ^ "LEDE Source Repository: /target/Config.in". March 30, 2017. Archived from the original on September 26, 2017. Retrieved May 14, 2017. ^ Larabel, Michael (May 14, 2017). "OpenWRT Gets Forked By Some Of Its Own Developers As LEDE Project". Phoronix. Retrieved May 3, 2016. ^ a b Willis, Nathan (May 11, 2016). "LEDE and OpenWrt". LWN.net. Retrieved May 14, 2017. ^ Chirgwin, Richard (May 5, 2016). "Router hackers reach for the fork: LEDE splits from OpenWRT". The Register. Retrieved May 14, 2017. ^ Grüner, Sebastian (May 5, 2016). "OpenWRT-Kernentwickler starten eigenen Fork". golem.de (in German). Retrieved May 14, 2017. ^ Ahlers, Ernst (May 4, 2016). "Router-Firmware: LEDE als offenere OpenWRT-Alternative" (in German). Heise Online. Retrieved May 14, 2017. ^ Mehrtens, Hauke (June 26, 2017). "LEDE call for vote on remerge proposal V3". LEDE-DEV mailing list. Archived from the original on September 1, 2017. Retrieved August 31, 2017. ^ "OpenWrt Project: OpenWrt 18.06". openwrt.org. Retrieved November 2, 2018. ^ "LEDE Project: LEDE 17.01.0 - First Stable Release - February 2017". lede-project.org. Retrieved October 20, 2017. ^ "LEDE Project: LEDE 17.01.1 - First Service Release - April 2017". lede-project.org. Retrieved October 20, 2017. ^ "LEDE Project: LEDE 17.01.2 - Second Service Release - June 2017". lede-project.org. Retrieved October 20, 2017. ^ "LEDE Project: LEDE 17.01.3 - Third Service Release - October 2017". lede-project.org. Retrieved October 20, 2017. ^ "LEDE Project: LEDE 17.01.4 - Fourth Service Release - October 2017". lede-project.org. Retrieved October 20, 2017. ^ "OpenWrt/LEDE 17.01.5 - Fifth Service Release - July 2018". lede-project.org. Retrieved July 20, 2018. ^ "OpenWrt/LEDE 17.01.6 - Sixth Service Release - September 2018". lede-project.org. Retrieved November 2, 2018. ^ "The OpenWrt Flash Layout". OpenWrt Project. Retrieved July 7, 2018. ^ Corbet, Jonathan (June 15, 2011). "Debating overlayfs". LWN.net. Retrieved July 7, 2018. ^ "The UCI System". OpenWrt Project. Retrieved July 8, 2018. ^ "29C3: ISP's black box". events.ccc.de. January 19, 2013. ^ "kernel: add codel and fq_codel to generic 3.3 patch set". dev.archive.openwrt.org. May 16, 2012. Retrieved July 2, 2018. ^ a b c "OpenWrt Buildroot – About". openwrt.org. Retrieved October 21, 2013. ^ "OpenWrt Buildroot - Usage and documentation". openwrt.org. January 8, 2006. Retrieved October 21, 2013. ^ a b Tao Jin (February 13, 2012). "OpenWrt Development Guide" (PDF). Wireless Networks Lab, CCIS, NEU. Retrieved October 21, 2013. ^ "Creating packages". openwrt.org. Retrieved October 21, 2013. ^ "OpenWrt Project: Table of Hardware". openwrt.org. Retrieved July 2, 2018. ^ "OpenWrt Project: Buyers' Guide". openwrt.org. Retrieved July 2, 2018. ^ "Simet Box". Retrieved September 14, 2017. ^ "Announcing the OpenWrt/LEDE merge". Linux Weekly News. Retrieved June 8, 2018. ^ "CeroWrt Wiki". Retrieved September 16, 2015. ^ "ANNOUNCE: debloat-testing kernel git tree". LWN.net. Retrieved February 13, 2014. ^ ""closing time" message from author on PacketProtector forum". Archived from the original on April 21, 2013. ^ "Free Software Foundation adds libreCMC to its list of endorsed distributions". FSF.org. September 4, 2014. Retrieved December 21, 2014. Wikimedia Commons has media related to OpenWrt.